Within the vertebral column, there is an extended cavity called the vertebral canal. 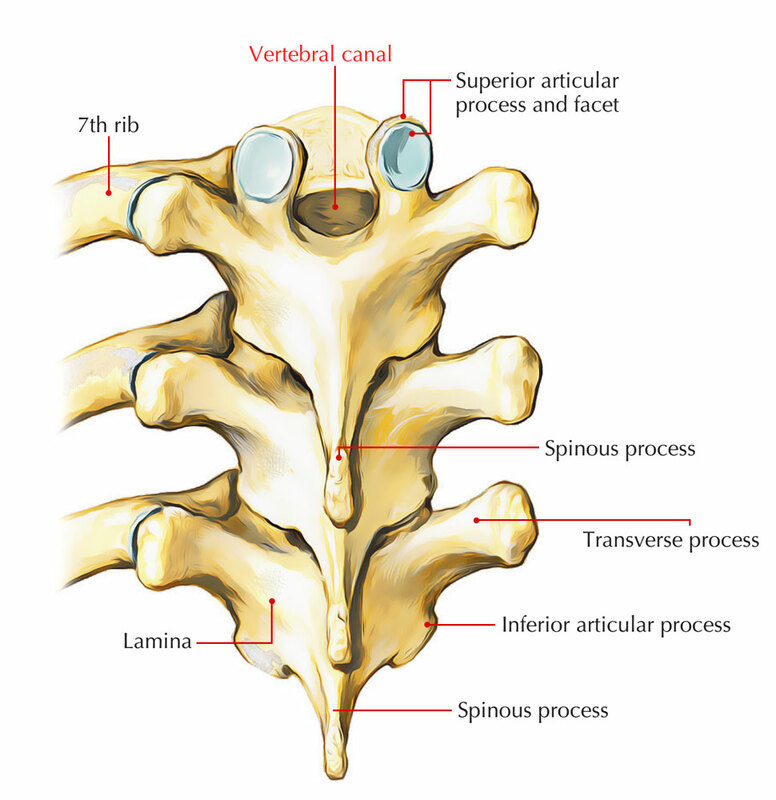 When the vertebrae are set together within the vertebral column, the entire series of vertebral foramina stacked one over another is called Vertebral canal or Spinal canal. This canal houses the Spinal cord along with meninges and epidural space. Generally, a ventral body and a dorsal neural arch create each vertebra which, surround the vertebral foramen among them. The vertebral canal contains spinal cord which is surrounded by its meninges. The bony wall of the canal is separated from the spinal meninges by the epidural space. The epidural space is the outermost portion of the spinal canal. The nearby vertebrae, located outside the dura mater that surrounds the arachnoid mater, subarachnoid space, the cerebrospinal fluid, along with the spinal cord create this space. The epidural space is located in the middle of the spinal dura and the periosteum covering the vertebral canal. It is occupied by loose areolar tissue and semiliquid fat. Network of internal vertebral venous plexuses. A single anterior spinal artery, which originates within the cranial cavity when two vessels that emerge through the vertebral arteries combine with each other. The single anterior spinal artery, together with the surface of the spinal cord, travels inferiorly and almost parallel towards the anterior median fissure. Two posterior spinal arteries, usually arising directly from a concluding branch of each vertebral artery which is the posterior inferior cerebellar artery, which also originates in the cranial cavity. The right and left posterior spinal arteries, as two branches which bracket the posterolateral sulcus along with the attachment of posterior roots with the spinal cord, travel downwards together with the spinal cord. Eight to ten segmental medullary arteries support the anterior and posterior spinal arteries throughout the distance of their path. The arteria radicularis magna or the artery of Adamkiewicz is the largest one among them. It arises generally on the left side within the lower thoracic or upper lumbar region and supports the arterial supply towards the lower part of the spinal cord, together with the lumbar enlargement. Feeder arteries travel inside the vertebral canal via the intervertebral foramina at every plane and are among the main arteries that supply the spinal cord. Anterior and posterior radicular arteries are created by the segmental spinal arteries after traveling into the intervertebral foramen. This takes place at each vertebral plane. The radicular arteries trail as well as circulate the anterior and posterior roots. The segmental spinal arteries also produce segmental medullary arteries at different vertebral levels. These vessels travel directly towards the longitudinally oriented vessels and support them. Alongside the spinal nerve roots, they enter the vertebral canal via intervertebral foramina. Spinal cord, together with its nerve roots and meninges, along with the neighboring bones as well as ligaments receive blood circulation from them. 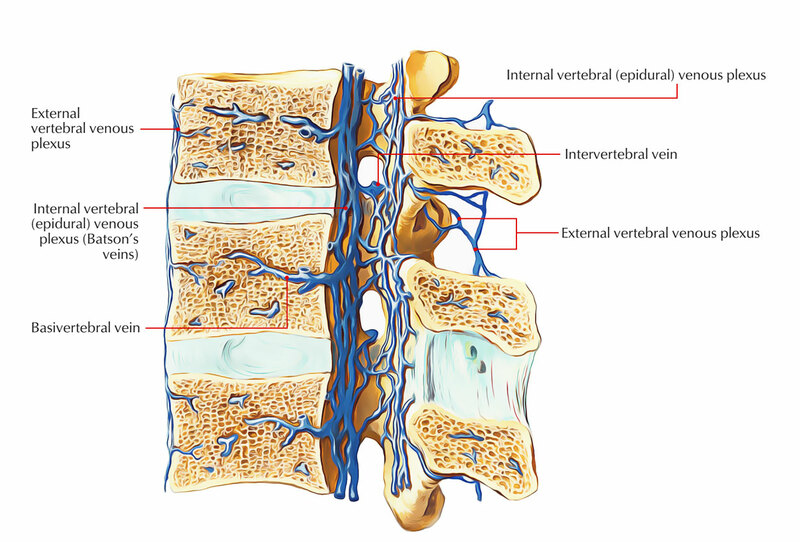 The internal vertebral venous plexus spreads out throughout the extent of the vertebral canal and basically is a venous network located inside the epidural space of the vertebral canal. The dural venous sinus within the cranial cavity and these veins show resemblance to each other and are constant with them from beginning to end with the foramen magnum. Four subordinate longitudinal channels drain the plexus: two posterior and two anterior. While the posterior internal vertebral venous plexus is mainly located anterior towards the laminae, the anterior internal vertebral venous plexus is more protuberant one and mainly located posterior towards the vertebral bodies. The internal vertebral venous plexus drains spinal meninges as well as spinal cord, besides draining venous blood from the vertebrae. The external vertebral venous plexuses are made up of the anterior along with posterior external vertebral plexuses which envelop the vertebral column. They create numerous connections together with the azygos, lumbar as well as deep cervical veins, along with the internal vertebral venous plexus. While the posterior external vertebral venous plexus is located posterior towards the vertebral arch, the anterior external vertebral venous plexus is located anterior towards the vertebral bodies. Subdural space is the possible space that can occur in the middle of the dura as well as arachnoid maters, while subarachnoid space is the space in the middle of the arachnoid mater and pia mater. Spinal dura mater is the farthest meningeal membrane and it is divided from the bones creating the vertebral canal through an extradural space. Superiorly, together with the inner meningeal layer of cranial dura mater, it is constant at the foramen magnum of the skull. Inferiorly, the dural sac radically contracts and creates a covering sheath for the pial part of the filum terminale of the spinal cord at the plane of the lower margin of vertebra SII. This terminal cord-like extension of the dural part of the filum terminale which is dura mater and connects towards the the vertebral bodies of the coccyx on posterior surface. Subdural space: The subdural space spreads out towards a short space nearby the roots of the spinal nerves. In the middle of the spinal dura and arachnoid mater, it is a potential space which because of a thin layer of serous fluid, functions as a lubricant. The dura mater can easily shift over the arachnoid. Superiorly it is continuous with the arachnoid mater surrounding the brain and below it spreads outwards up to the lower border of second sacral vertebra. It loosely encloses the spinal cord and is structurally is a thin, transparent vascular membrane. The arachnoid mater transmits numerous fragile thread-like projections through the subarachnoid space towards the pia mater forming a spider’s web-like pattern. Subarachnoid space – It is relatively large space in the middle of arachnoid mater and pia mater. It connects over the brain at the foramen magnum with the subarachnoid space. It narrowly encloses the spinal cord and is a vascular membrane. At some places the pia mater is altered. These alterations are referred to as processes of pia mater. filum terminale externum: This is lower quarter of the filum and blends by the enclosing the dura mater then proceeds inferiorly in order to connect to the dorsal coccyx. The pia mater creates narrow ribbon-like transparent bands called ligamenta denticulata on each side between the dorsal and ventral nerve roots. The lateral margin of each ligamentum denticulatum transmits 21 teeth-like projections, to connect on the inner side of the dural tube in the middle of the points of beginning of two adjacent spinal nerves that pass via subarachnoid space as well as arachnoid mater. Thus ligamenta denticulata supports to fix the spinal cord in the middle of the subarachnoid space. While the last projection is located in the middle of T12 and LI spinal nerves, the first projection of ligamentum denticulatum is at the level of the foramen magnum. Linea spledens is a thickened band of pia mater next to the anterior median fissure of the spinal cord. Pia mater produces a septum within the anterior median fissure. The pia mater gives a thickening, called linea splendens where this projection is produced. It is a perforated pial septum within the midsagittal plane, which posteriorly connects the pia mater to arachnoid mater. Posteriorly, the posterior median septum of the spinal cord is also connected to the pia mater. 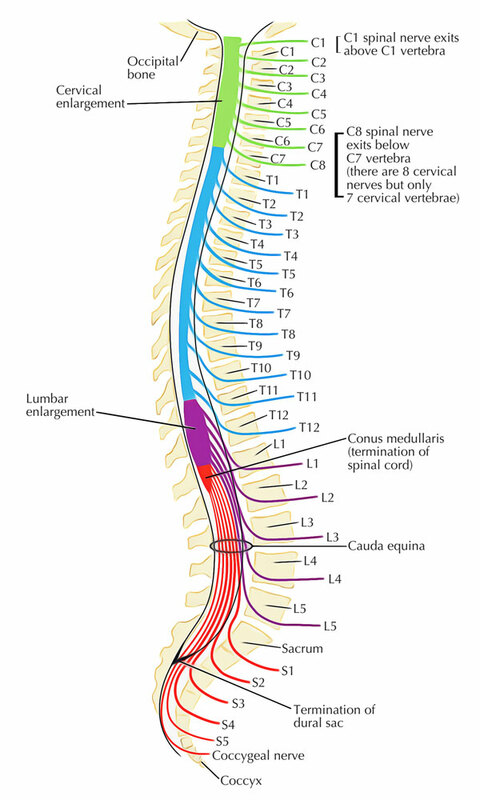 The spinal cord which inhabits the upper two-thirds of the vertebral canal is the longer low cylindrical part of the central nervous system with an average length of 45 cm. It begins as the extension of medulla oblongata at the foramen magnum and generally ends at the middle of the L1 and L2 vertebrae on the other side of the intervertebral disc. The spinal cord spreads to the level of the lower border of S2 vertebra in the fetus. 31 pairs of spinal nerves arise from the spinal cord. The girth of spinal cord grows significantly in the regions that give origin to large nerves of the limbs. These expansions are called cervical and lumbar swellings/enlargements. Attachments of spinal nerve roots. Enlargements of the spinal cord. A deep midline indentation called anterior median fissure is present in the anterior aspect of spinal cord. It spreads along the entire length of the spinal cord. It has anterolateral sulci on each side of anterior median fissure. The posterior aspect of the spinal cord presents a shallow posterior median sulcus, from which a posterior median septum of neuroglial tissue expands within the substance of the cord to multiple levels. Inside the intervertebral foramina combination of the anterior and posterior roots of the spinal nerve takes place. 3 or 4 or rootlets, which arise with the anterolateral sulcus of the spinal cord creates the anterior root. Several rootlets, which are connects to the posterolateral sulcus of the spinal cord creates the posterior root. Separately before combining in order to create the nerve trunk where both cleave dura mater, the anterior and posterior roots travels toward their specific intervertebral foramina. Inside the intervertebral foramen the ganglion on the posterior root is located proximally towards the point of joining of anterior as well as posterior nerve roots within the tubular insertion of dura as well as arachnoid. Cervical enlargement: Brachial plexus is created by the nerves originating from these segments. In C5-T1 spinal segments area. Lumbar enlargement: Lumbar plexus is created by the nerves arising from these segments. In L2-S3 spinal segments area. The spinal cord consists of a central mass of grey matter comprising of nerve cells and peripheral mass of white matter constituting fiber tracts. Motor neurons: These are present in the anterior and lateral horns. Sensory neurons: They transport sensory stimulus towards the different parts of the brain creating ascending tracts; or towards the other sections of spinal cord creating intersegmental tracts and are present in the posterior horn. Interneurons: They link different varieties of neurons. They are also referred to as association neurons. These are involved in combination of segmental activities and are either inhibitory or excitatory. The central H-shaped mass of grey matter is surrounded by the white matter of the spinal cord and mainly consists of nerve fibres; their large proportion is myelinated which gives it a white appearance. Posterior white column is located among the posterior median septum and the posterior horn. Lateral white column is located among the anterior and posterior horns. Anterior white column is located among the anterior median fissure and the anterior horn.